This is my 2nd post today so if you are looking for the Cardz TV Blog Hop, please click the links at the top of this page. My card is a standard A2 size and the cardstock I used is Bazzill. I layered a black mat onto my white card base and on top of that, I layered a piece of Recollections lavender patterned paper. I'll start with my cute adorable image, Mikayla Ann. She is a digi stamp from the Cutting Cafe. I printed her out and colored her in using copics E00, E02 and E51 for her skin. I used Y12, Y18 and Y19 for her hair and colored in one of the easter eggs in the grass using Y18. Her dress and socks were colored in using BV08, BV11 and BV13 while her shoes were colored in using C5 and C8. I then decided to color the easter egg she was holding in R81 and R83. I used G07 and G09 to color in the grass and her eyes. Then I used R24 to color the bow around the egg she's holding and also on the small cracked open egg in the grass. To give the image some sparkle, I added some rock candy stickles to the eggs and bows. The cute little bunnies came from the new stamp set Happy Easter by Lawn Fawn. I colored them in using copics BV23, C5, RV02(ears) and I added some B000 around the inside of the tails. Then that cute little bee... aaahh... well that bee is also from Lawn Fawn and comes from the stamp set, Gnome Sweet Gnome. I colored the bee in using Y18, B000(wings) and 100. I also stamped the bee trail from that same stamp set. 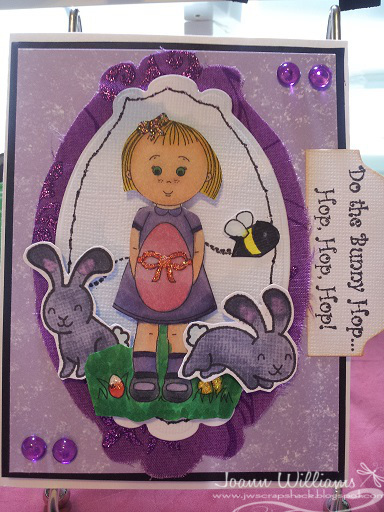 After I colored and cut out the stamps, I put them on foam adhesive and then decided to build a Springy/Easter scene. I used my momento summer skies ink and a cloud template to create the look of the sky and clouds on a beautiful spring day. Once I got the look I was going for, I took the "sky" paper and cut it out using my Spellbinder's Labels Ten Dies. I also cut out some beautiful glittery purple fabric out of the same die to build my main layers. I used some faux stitching in black, around the inside of the "sky" layer to give some added texture. I then adhered all my stamped pieces up on foam tape to the main layer. To finish off the card front, I cut out a journal tag from the Papertrey Ink's Journal Tabs Dies and inked around it using tea dye distress ink and then stamped the sentiment "Do the bunny Hop, hop, hop hop!" in momento tuxedo black ink. The sentiment stamp is from Cardz TV's Easter Punnies stamp set. It still needed a little something so I added some purple Royal Jewels from the Royal Castle Shoppe. 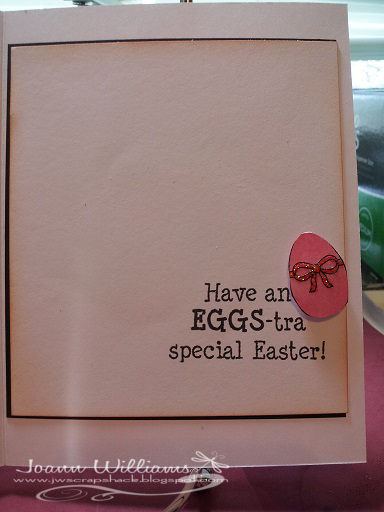 Below is a peek at the inside which uses the sentiment, "Have an Eggs-tra special Easter!" also from the Cardz TV Stamp set "Easter Punnies" and uses another egg that I had cut out, colored and popped up. I hope you have enjoyed my card today and I sure hope you stop by Kellie's Blog to see what she created for our week 9's personal challenge! This little girl is precious!!! Super cute card, my friend!!! I only have two copics....love them!!! what a sweet little card! Thank you for linking up with us for linky party #2 over at http://craftindesertdivas.blogspot.com/. What a super cute Easter card Joann! I love that cute little girl and I love how you used so many other supplies in the making of this card! Well done! Your Easter card is just DARLING!!! !The image is precious!Cute sentiment!! Both cards are really cute! Great coloring on the first and I love the CAS style of the second! Adorable, love those purple bunnies!! This is so cute! Love the purples. Great job coloring the digi. Love it! Found your message in my email. Sorry I thought I left my blog info too. Have a great week. Cute card! I like how you cut out the bunnies and gave them dimension. I like how you added the sentiment as a tab. Great idea! I like the sparkle you added to the eggs and bow. Nice job of coloring the images. The royal jewels was a nice touch! I also like how you added an egg with your inside sentiment. Well done! Very cute Easter card, Jo! Thanks for joining us for the Little Miss Muffet Easter Challenge! Very cute! I love all the purple! Thanks so much for joining us at Paper Playtime! cute scene...!! the hoppy bunny is so adorable..! 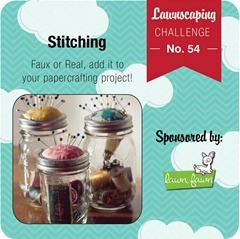 Thank you for playing along with us at Lawnscaping..! What a sweet scene you created. Thanks so much for joining in the fun at Little Miss Muffet Stamps!